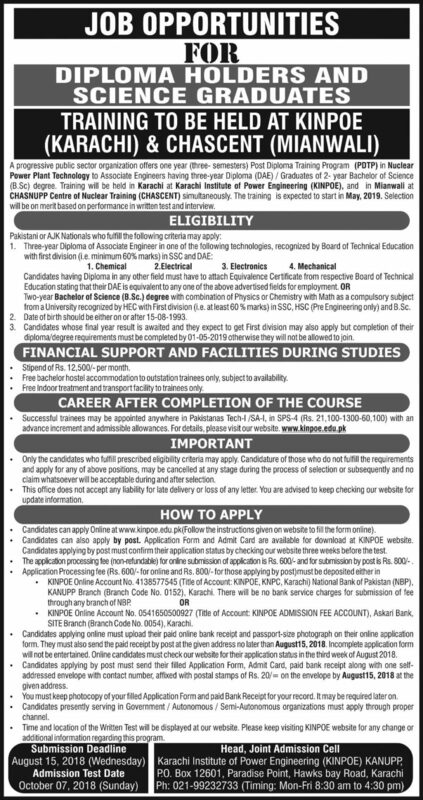 Job opportunities for Atomic Energy PAEC Jobs for Diploma Holders & Science Graduates training to be held at KINPOE (KARACHI) & CHASCENT (MIANWALI). Candidates having Diploma in any other field must have to attach Equivalence Certificate from respective Board of Technical Education stating that their DAE is equivalent to any one of the above-advertised fields for employment. OR Two-year Bachelor of Science (B.Sc.) degree with the combination of Physics or Chemistry with Math as a compulsory subject from a University recognized by HEC with First division (i.e. at least 60% marks) in SSC. HSC (Pre Engineering only) and B.Sc. Date of birth should be either on or after 15-08-1993. Candidates whose final year result is awaited and they expect to get First division may also apply but completion of their Diploma/degree requirements must be completed by 01-05-2019 otherwise they will not be allowed to join. The stipend of Rs.12,500/- per month. SAtomic Energy PAEC Jobs uccessful trainees may be appointed anywhere in Pakistan as Tech-I /SA-I, in SPS-4 (Rs. 14,340-880-40,740) with an advance increment and admissible allowances. For details, please visit our website. www.kinpoe.edu.pk. Only the candidates who fulfil prescribed eligibility criteria may apply. Candidature of those who do not fulfil the requirements and apply for any of above positions may be cancelled at any stage during the process of selection or subsequently and no claim whatsoever will be acceptable during and after selection. • This office does not accept any liability for late delivery or loss of any letter. You are advised to keep checking our website for updated information. 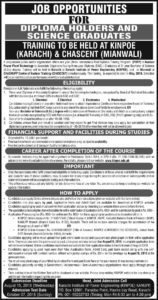 HOW TO APPLY in Atomic Energy PAEC Jobs? Candidates can apply Online at www.kinpoe.edu.pk (Follow the instructions given on the website to fill the form online). Candidates can also apply by post. Application Form and Admit Card are available for download at KINPOE website. Application Processing fee (Rs.600/- for online and Rs.800/- for those applying by post) must be deposited either in KINPOE Online Account No. 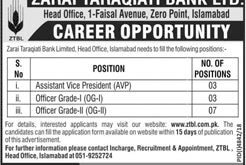 4097253197 (Title of Account: KINPOE, KNPC, Karachi) National Bank of Pakistan (NBP), KANUPP Branch (Branch Code No. 0152), Karachi OR KINPOE online Account No. 0541650500927 (Title of Account: KINPOE ADMISSION FEE ACCOUNT),Askari Bank, SITE Branch (Branch Code No. 0054), Karachi. Application Form and Admit Card duly completed along with two self-addressed envelopes with contact number affixed with postal stamps of Rs.20/- on each envelope and online Bank receipt as application processing fee must reach the following address not later than August 15, 2017. Candidates presently serving in Government / Autonomous / Semi-Autonomous organizations must apply through proper channel. Admit Card for the Written Test will be sent only to the eligible candidates. Time and location of the Written Test will be given with the Admit Card and can also be seen at our website. Please keep visiting KINPOE website for any change or additional information regarding this program.